A man killed outside Parsons Green Tube station was stabbed after confronting a drug dealer, Scotland Yard has said. Omid Saidy was fatally wounded and two others were injured in the attack on Monday night. 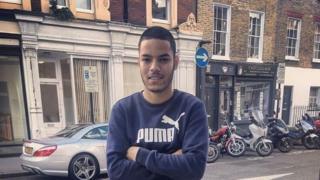 The 20-year-old from Fulham died after confronting a drug dealer and another man who was with him, the Met confirmed. The injured 16-year-old was discharged from hospital and arrested on suspicion of murder and attempted murder. A 20-year-old man suffered serious but non life-threatening injuries. After confronting the drug dealer, the victim chased the two suspects in the direction of Beaconsfield Walk, police said. When he caught up with the pair, he was fatally stabbed. A 20-year-old man who was a friend of the deceased came to his aid and was also stabbed. One of the suspects, described as a black male dressed in dark clothing, fled down Harbledown Road in the direction of Fulham Court. The second suspect, a young white male, ran into Beaconsfield Walk. Police believe he called for an ambulance a short time later for his own injuries. Det Ch Insp Noel McHugh said: "A young man has tragically lost his life for simply asking a drug dealer to move on. "I urge anyone who can assist our investigation to come forward without delay." A post-mortem examination is scheduled for Wednesday.